Peter is eleven years old and he left school in primary three. He comes from a village in Eastern Uganda. He grew up living with his mum and dad, but then when his mother and father got divorced, his mother disappeared and he had not seen her for three years. When his father remarried, Peter continued to stay with his step mother. However, it was not long before she started to mistreat him. He was beaten, abused and never allowed to eat when his father was not in the home, which was often. He was often told to go and look for his mother. However, Peter knew that was not an option since he didn’t know where she was, so he began thinking about looking for his grandparents, who he had not seen since he was 5. He knew he would struggle to recognise their house, but he did not have another option. 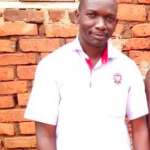 Peter made up his mind to find a new life by staying on the streets of different towns. So one day he started his journey from where he was staying with his step mother and came to the streets. He first stayed in one town then he later changed to another. While in the first town he was welcomed by several young children aged between 10 and 12 years. He stayed with them for more than two years and later shifted to another town. In the second town, he was joined by children aged between 10 and 17 years in street life. He stayed with them for a period of five months, looking for scrap and plastic bottles and then selling them to get money which could help him to buy food and other items. He also used to help restaurant owners in fetching for them water, washing plates, sauce pans and taking out their rubbish and at the end of the day they could pay him a little money for survival. One day, a team from S.A.L.V.E. International were carrying out a street walk in the streets of the town. They saw Peter and introduced themselves to him. 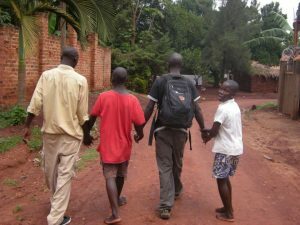 He accepted to walk with the team up to the Drop in Centre. It was from this time that Peter started attending the Drop in Centre activities like lessons, counselling sessions and sports. At the same time, S.A.L.V.E. staff were listening to him and learning about his home and background information. With time at the Drop in Centre, Peter started to trust us, open up and begin thinking about leaving the streets. Soon, he requested that one of the staff could prepare him to be home traced to his grandmother’s place. I engaged him in several counselling sessions. It was through these that I came up with an action plan for Peter on how he could be home traced from the street to his home. To begin with, I had wanted him to spend some time at the Halfway Home to prepare for returning home after such a long time on the street. However, Peter shared he didn’t want this, he wanted to go straight back home. We listened to him. At the Drop in Centre, we’re aware that every child is different and that their route back home will be different too. So time came when he was ready to be home traced. Peter asked me to take him to his grandmother’s home not his father’s home because he was scared about being mistreated by his step mother again. I agreed but told him that when home tracing we would first take him to his father’s home before proceeding to the grandmother’s home. Peter accepted my idea. The day for home tracing Peter came, and together we left the Drop in Centre. When we arrived at his father’s home, his step mother was inside the house. I introduced myself to her and she welcomed us into the house. She gave us some chairs to sit on in the house, and I told her more about who I was and about the work of S.A.L.V.E. and she also introduced herself to us, but seemed uncomfortable. She told me that she knew Peter was her husband’s son, but did not want him to stay with her. She said the local council had assumed she had kidnapped him as he had not been seen for some time. The father was not around, but we got his phone number so we could follow up with him and keep him informed about what was happening with his son. We got a boda and started another journey to find Peter’s grandmother’s home. We moved and moved but had not reached the home and yet Peter had told us that the place was near. Realising that we were not reaching the real home, I told the boda man to stop and I asked a man who was digging along the road. I greeted him and requested some help, I asked Peter to please tell us the name of the grandmother but he could not remember it since he had left his grandmother’s home when he was still too young. I asked him to tell us the name of his grandfather who had passed on but still he could not remember him. He could only remember that his grandfather had a herd of cattle but had passed on. 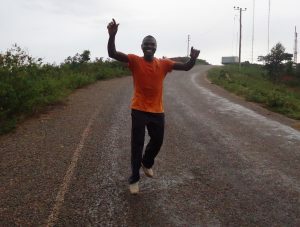 Luckily, the gentleman now remembered the name of Peter’s late grandfather and directed the boda to that home, so we proceeded on and finally we reached the home. On our arrival, we realised that we had already passed the place several times but the problem was that Peter could not remember the home. The grandmother welcomed us and she was so happy to see her grandson again. Her happiness turned into tears as the two were reunited. She narrated to us the story on how Peter left them and even Peter’s mother leaving home and not knowing where she had gone up to now. 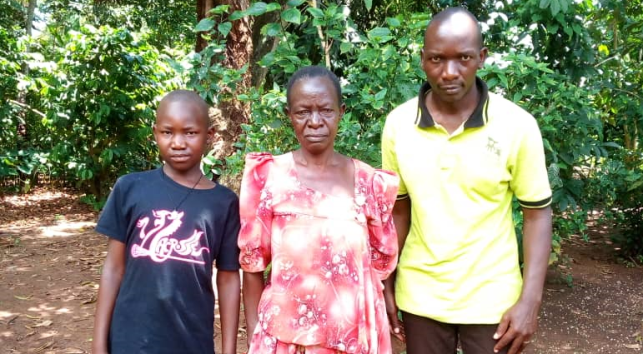 His Grandmother told us that she had heard that her grandson was always being mistreated by the step mother, but that she could not afford to help. I spent some more time talking about how S.A.L.V.E. met Peter, and all of the work we do with children to support them and their families. Finally, the grandmother thanked S.A.L.V.E. International for the support offered to their grandson and she accepted to have her photo taken together with Peter, both full of joy and happiness. She agreed to stay with Peter from that day on. Now, Peter is staying with his grandmother as I continue to make follow ups with them to see how he is copying with the environment after a long time being on the streets. 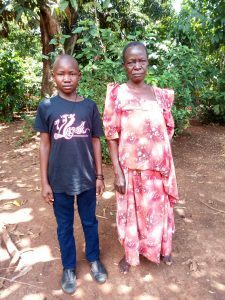 As he settles we will assess the home and see how we can support him to study again and his grandmother to be better able to care for him by joining our business programme for example. Thank you to everyone out there who has lent a hand to S.A.L.V.E. so we can help children like Peter turn their lives around. After two and a half hard years on the streets he is finally home. * Peter’s name has been changed in this public forum for chil protection purposes. The family gave permission for the story to be shared.